I really like your new doll and I am looking forward to seeing more of her. I loved all the alternative hairstyles you did for The Lady f the Manor and I was hoping that you would make some for Flora as well? I hope to do some additional hair styles for her eventually, Marie Louise, but research into historic hair can be a bit of a challenge. I found one excellent book, so in a few weeks she might have some other hair options. That’s pretty! I can’t wait to color her nightgown! Seafoam green I’m thinking…. I’ll be spreading the word as well. Thanks Rachel, I’m sure her chemise/nightgown would look lovely as a seafoam green color. I have been debating drawing her a “real nightgown”, but can’t find any source images for a Regency era woman’s nightgown (men’s nightshirts seem quite common). 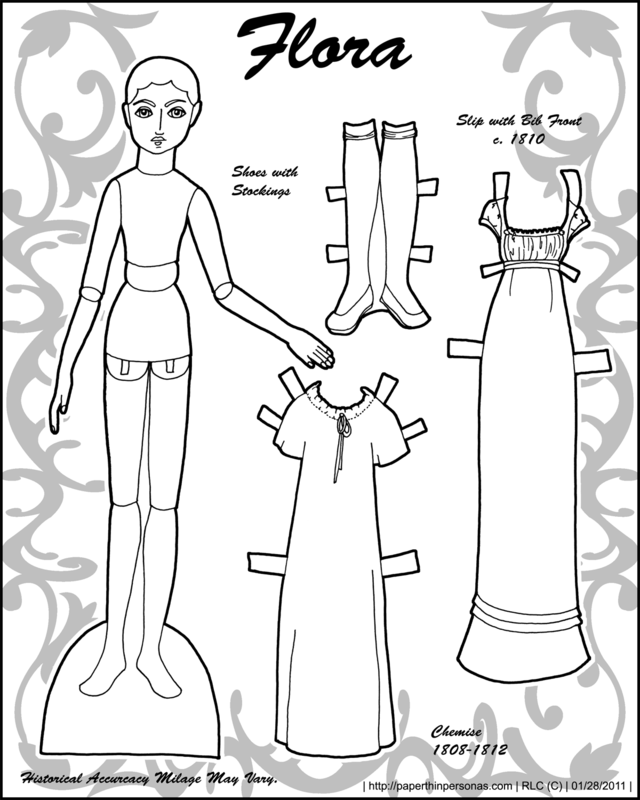 Spiffy, a new doll to colour… whenever I’ll have time/energy to colour… but YAY!